Kim Fields * Lifestyle Properties * 425-327-6302 Making Your Dream A Reality! "Large Rambler on 2.62 Acres "
Year Built: 1979 "Remodeled Rambler!" Welcome home to this updated Rambler on 2.62 acres! Featuring large tiled entry, 3 bdrms + den/4th bdrm, spacious chef's kitchen which has been updated with new cabnitry, granite countertops stainless steel appliances, breakfast bar, and dining space,. The large great room has free standing woodstove which heats the house, as well as a new ductless heat pump to add A/C in summer. Master suite has stunning 5 piece bath, dual shower and soaking tub. Beautiful cabinetry with crown molding, granite countertops in the kitchen, bathrooms. 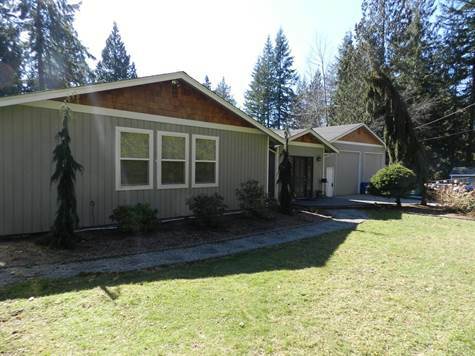 Extra deep 1280 sf attached Garage w/12' doors & its own woodstove! Park-like grounds, pasture, RV parking. All new windows as well.